People like to work with people they like. We are drawn to others that we get along with. (or should that be… drawn to those with whom we get along – to avoid dangling participles). Getting along may mean that you and the other person share common backgrounds, experiences, perspectives, like the same type of movies, watch the same shows on TV and more. We enjoy being around others that a similar to us. We also shy away from those that “rub you the wrong way”. It might be demonstrative, in that the other person really appears to not like us at all. We might think that they are even out to get us. They disagree with a lot of our comments, always point out the negatives in our ideas or just roll their eyes when we talk. It might be more subtle and passive/aggressive as they talk behind your back or insult you and then deny that they did – “I was just kidding”. Which brings me to kindness and compassion. These two qualities need to be in a leader. They are defines as acting in a thoughtful way to the rights and feelings of others and consciousness of others’ distress together with a desire to alleviate it. They are action words. Think “random acts of kindness” and the many organization that encourage kindness. Think Compassion International, an organization that helps third world children in distress. Those that are kind and compassionate put their thoughts into action. It may be a lost art today. Many just tell others to toughen up. To get over it. They do not apologize or even acknowledge when others feel slighted. They leave a wake of frustration in others by the mannerisms they project. They seem to be oblivious to what others might fell. They hide behind “just being honest”. They do not couch critique or feedback with softening words. They blurt out insulting comments under their breath (or directly to other peoples faces). They do not take any action to alleviate the impact of their negative words or deeds. They leave that to the person they are directed toward. They do not make moves to help others “save face”. People like coworkers and leaders that can be understanding and be forgiving. They appreciate it when they are given the benefit of the doubt. They are thankful when others do not place blame or demean them when they have not fully lived up to their own or others expectations. Now here is the “Don’t get me wrong” part of this post… I am not saying that sub quality work and low performance should be tolerated, but one or two slip ups should be overlooked. I am not saying that you should never correct others, but that it be done with a caring heart. I am not saying that you should never raise the bar and expect more from people, just that it be done in an encouraging way and not with negative threats. How does this add value? How does being kind help your firm? What place is there for compassion in today’s workplace? Because a kind word goes far. I believe that compassionate leadership makes for a happier workplace. I believe that you can get more done with an encouraging word than with a discouraging one. I believe that more can be produced by steering someone in the right direction than by towing them along. I believe that your firm will benefit from coaching and mentoring done with consideration for the other persons receptiveness and ability to make changes. High standards are needed, but moving people higher is done best with gentler words. 1 Comment To "Do You Add Value? 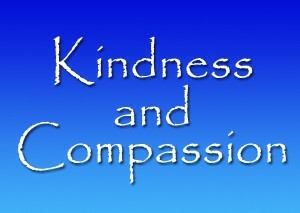 – Kindness and Compassion"
Ya learn sotnmhieg new everyday. It’s true I guess!